They said she was ruthless, said she was crude..."
She had a nasty reputation as "impossible", which has diminished of late due to several descents, but among veterans she inspires a hefty respect. 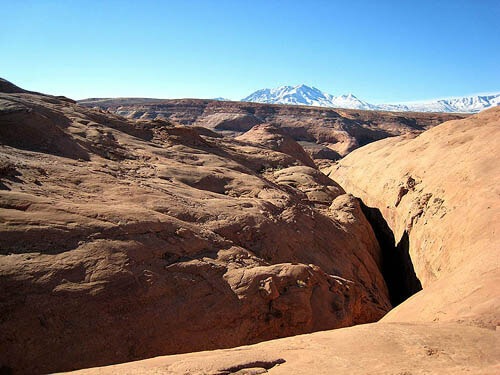 Sandthrax is a short, intense canyon in North Wash, next to the Leprechaun system. The stopper section is a 5" to 10" vertical crack about 15 feet tall, with 30 feet of exposure. It has been stemmed up high - very exposed and rated as 5.11c(?) - no thanks! The few who have tried to really free it say very awkward hard 5.10 or ... Personally, AFTER aiding as high as I could on two #6 Camalots, I thought it was still hard 5.9 or 5.10 to get over the top. Needless to say, intelligent Sandthraxers need a robust strategy for passing this obstacle. 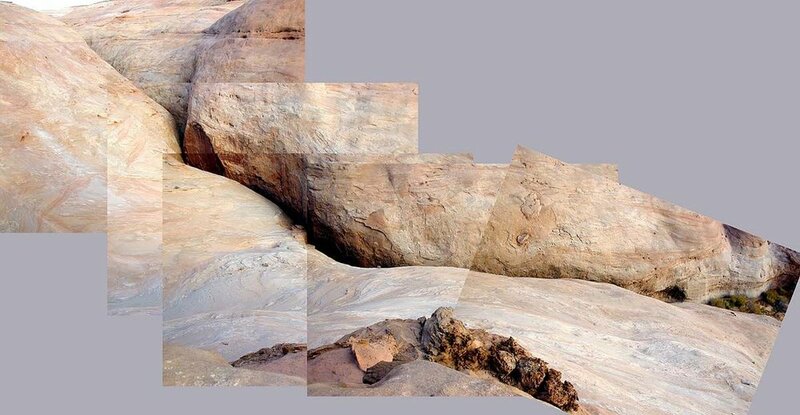 Outside this short bit, the canyon is a quite nice, sustained, not extremely difficult X- (X minus) high-stemming/mae west canyon that can be quite pretty and is fun for the mae-west-proficient. 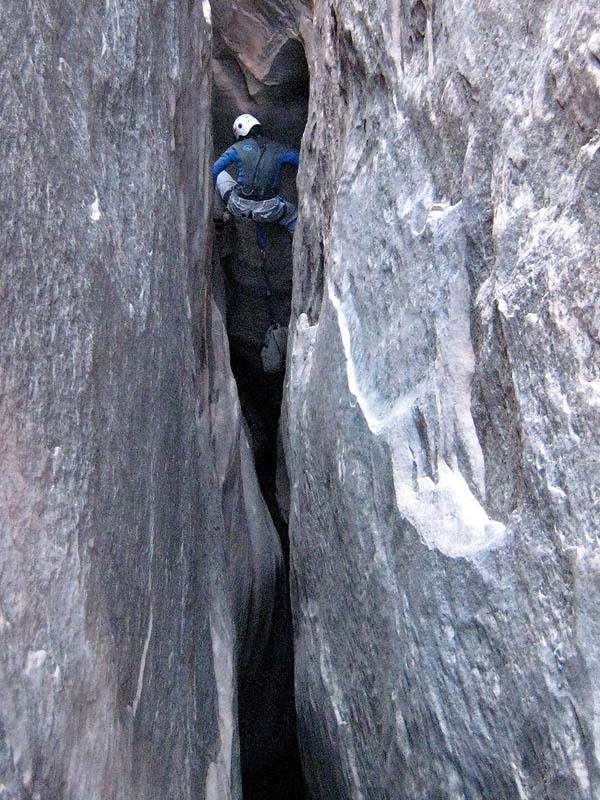 Most of the canyon can be cautiously passed in a back-feet chimney, with only a couple silos that require stretching out more, although the length of the sections without relief can be quite daunting. 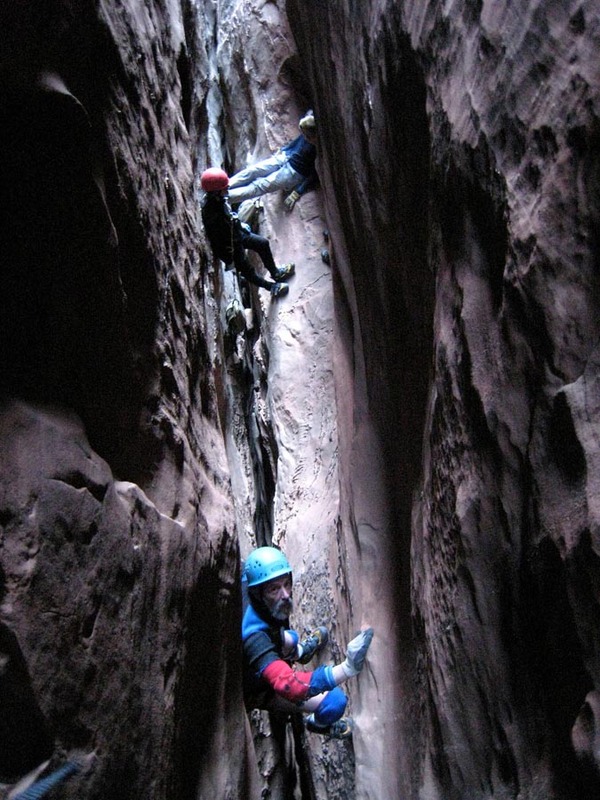 Don't underestimate the rest of the canyon - it is grueling. Difficult upclimbing and moderately difficult sideways climbing is required. Sandthrax requires full padding and body protection. Bring 70 feet dynamic rope: there are two short rappels in the canyon, up to 35 feet in length; and a belay possible across one of the silos. Bringing a dynamic rope will allow a dynamic belay on the crux. This allows the #5 Camalot at the base of the crack to position the rope, two #6 Camalots to climb most of the crack and one other piece to place above, either for aid or protection and also to anchor a rope for the seconding member of the party to ascend. Most parties will find a set of etrier handy, and rope ascending gear. (The crux has also been passed with a pack toss and some rather skilled climbing). Rim Team: Many parties go in with a rim team utilizing a 300' rope and at least two people. The crux can be supported from the east rim without too much difficulty. 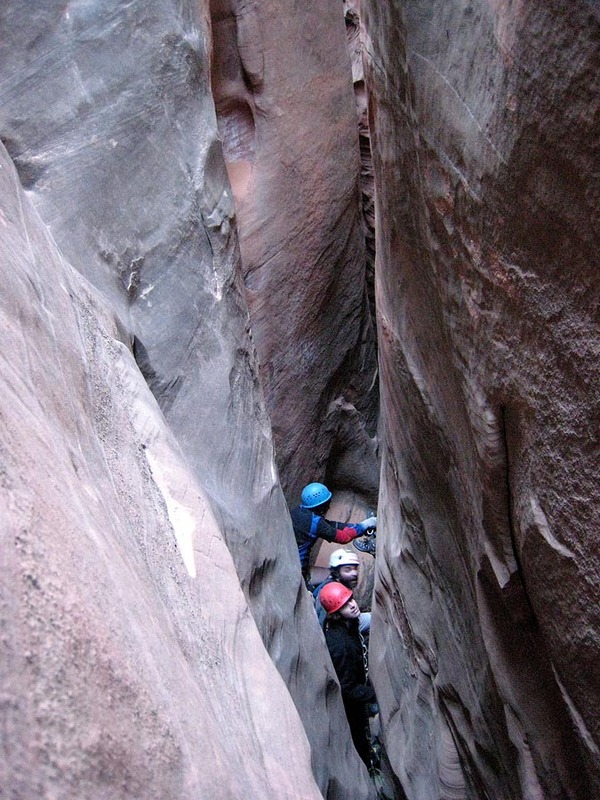 Gather the team and hike to the mouth of the canyon, where it exits the sandstone as a 3" slot. Back down canyon then up on the righthand (LDC) side, then follow the west side of the canyon to the head. Allow about 20 minutes. Gear up and start into the canyon with a bit of a downclimb. 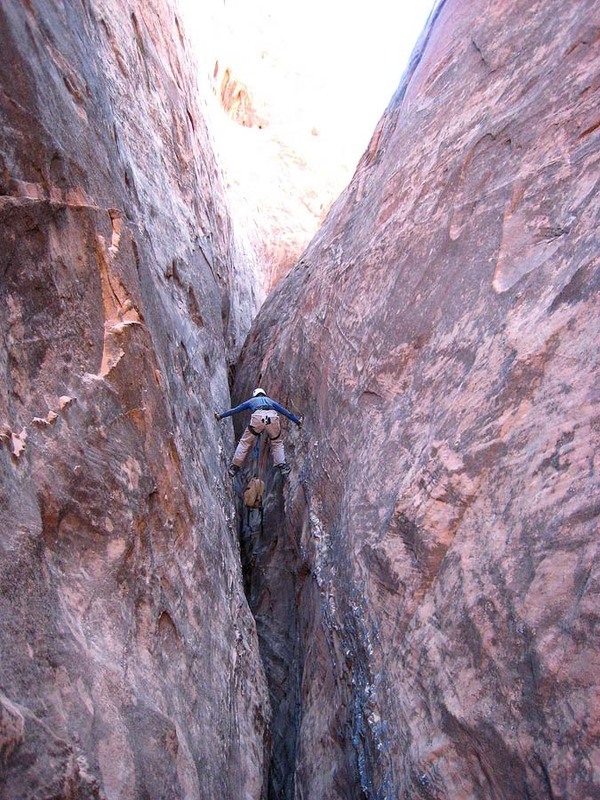 A short rappel is soon found - a sling around a rock provides anchorage. Say "Now we're in for it" to your partner. A bit of downclimbing and clambering across some nice small potholes to the first nasty bit - an exposed stem and climb up a nose to attain the high-ground above an extremely narrow slot. 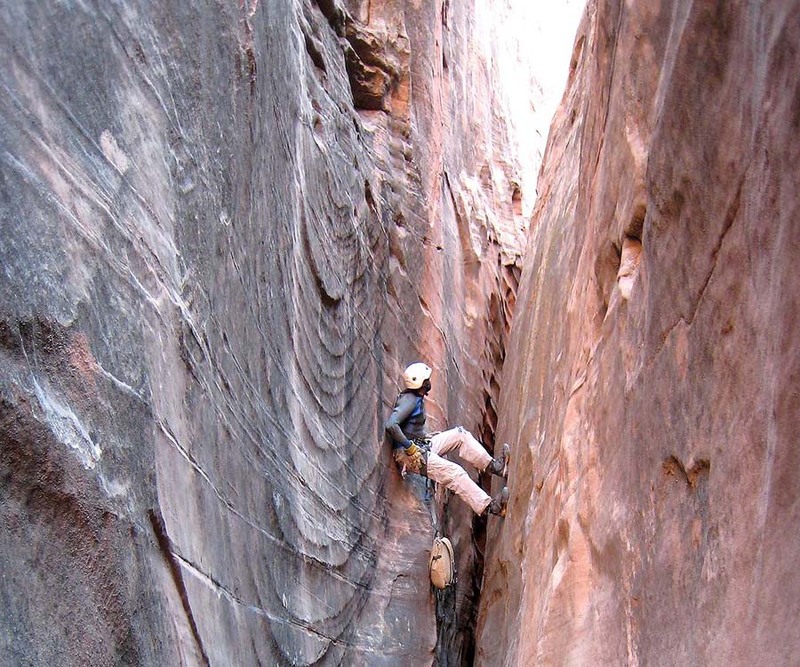 A belay and aggressive spot may be helpful in passing the exposed nose. 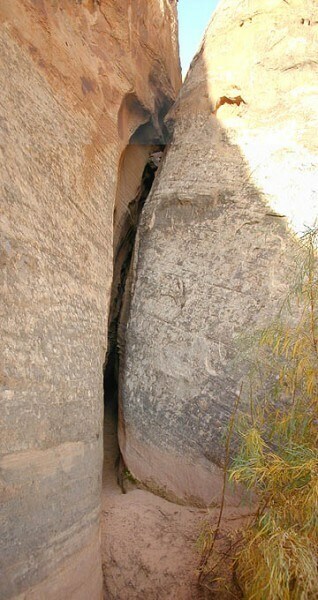 What follows is quite a long section of mae west passage above a deep and narrow slot. Pace yourself carefully and enjoy the absurdity of your situation. 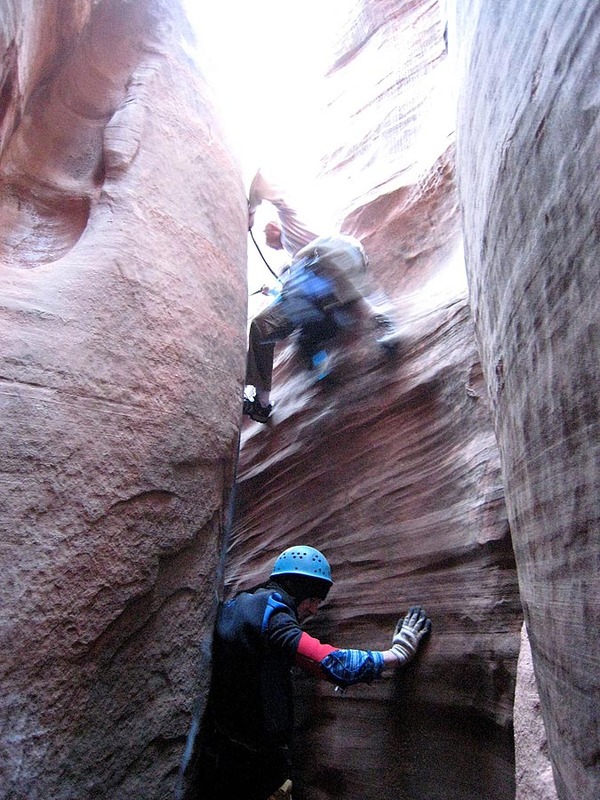 Forty-five minutes into the canyon, at a choice of up or down, take the elevator down to some nice ledges. 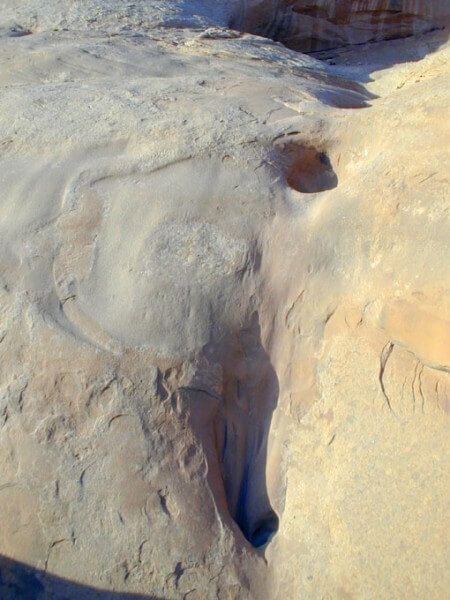 Soon after, you are forced pretty low, where you can see the bottom of the canyon, followed by a strenuous squeeze chimney up to some wedged chockstones. This is a good place to rest. A yawning silo is reached, which can be belayed off a drilled pin for both first and followers. The exposure is daunting, but the moves are not too difficult. A few feet beyond the silo, a steep elevator is taken down to the crux. Pass the crux (yields easily to good technique). More interesting climbing is found after the crux. 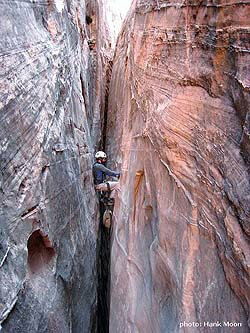 A wonderful 100-yard, very straight section dips down, then climbs up and right over to a second rappel off huecos. Then comes a very dark section on the ground, that opens to a strolling mini-subway section. The right rim is tantalizingly close. Don't let your guard down, there is more business ahead. The bottom drops out at an easy bombay stem. One more silo is passed in an area of poor quality rock and then, all too soon, the satisfied Sandthraxer finds him- or herself looking out at the mouth of the canyon. 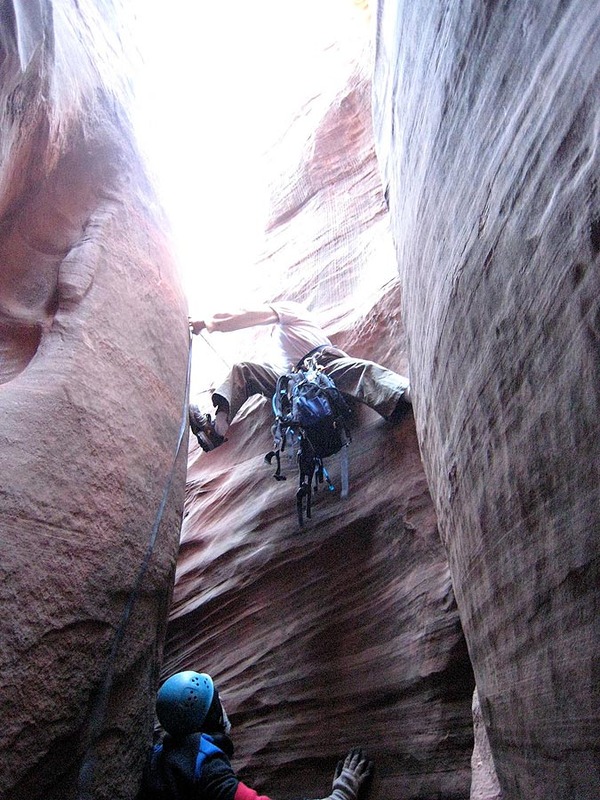 A short downclimb pops one out on the canyon floor. 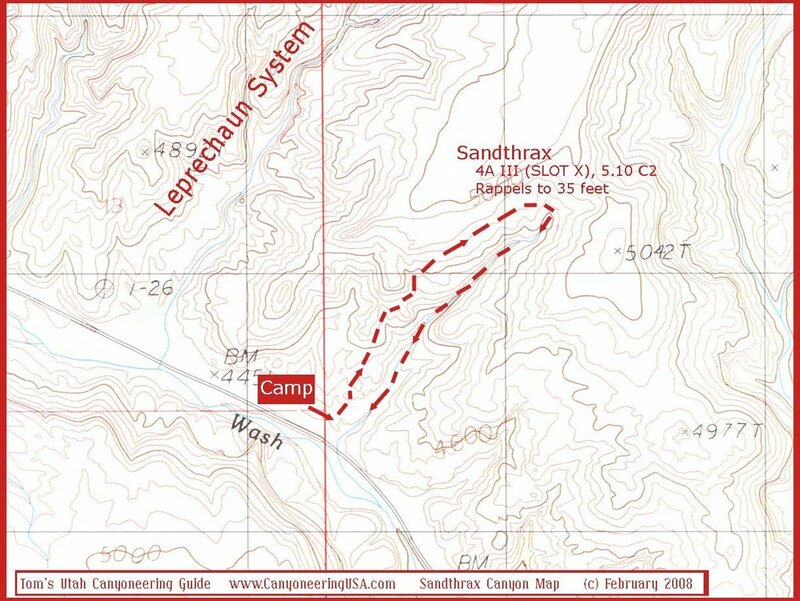 You should pop out right back at the Sandthrax/Leprechaun campsite. Yes, a couple other canyons were done. 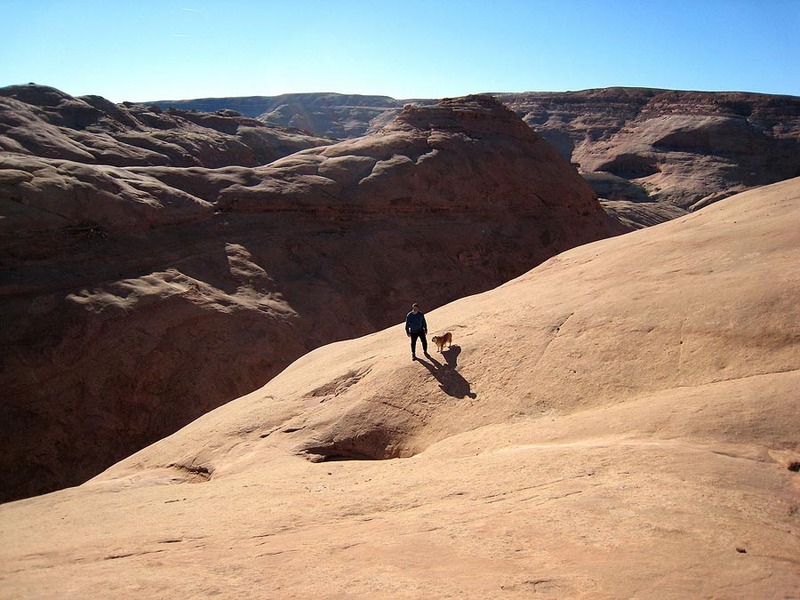 But the next BIG EVENT of note was a descent of Sandthrax Canyon by most of the gang on the 30th. Hank got a bunch of great pictures, and Ram wrote a wonderful trip report. 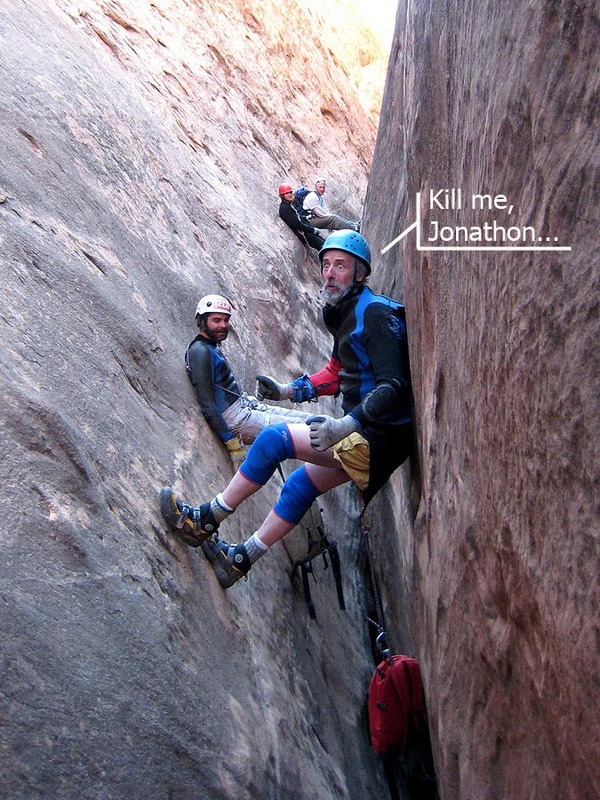 Sunday we visited The Chasm of Doom, aka Sandthrax Canyon, to see where our friends got stuck. Sandthrax IS a big deal, at least to those of us who are not X-canyon regulars. I have done it exactly once, with Ram and Wade Christensen in November 2007. I hope to get in shape to do it again.